Very nice set of photos. Now you and the @Irishwhistler are going to make me blow the dust off my camera. I don't have a great one, it's a Cannon Powershot 10x with 30X digital zoom. I've had it for quite a few years and it's probably time to upgrade it but it's still better than a phone. As I said above, even the most minute cameras can be manipulated into taking great pictures. I've had my share of 35mm cameras and have finally worked my way into the Canon M series cameras. but within those years, the Kodak easyshare & fujifilm XP60 were all useful and came in handy. So don't give up on your powershot. Many of my photographs & artwork will be showcased during "Applied Physics Laboratory Annual 2019 Art & Photography Show" via the Kossiakoff Center Tuesday, April 2- Monday, April 29. All of my images/art are for sale and 20% of each image sold goes to the Johns Hopkins Children’s Center. Here's your chance to own a framed print or print on canvas of my Lonely Teddy Bear Bookend or many other images being showcased at the Kossiakoff Center. Because I've linked all of the above images to my wordpress site, I've since closed the wordpress because of rampant spam accounts filling my comments sections. I was attempting to leave the comments open as to allow others to post comments if they are interested in purchasing any of these prints. Thus the reason the images have been removed. Never the less the wordpress site didn't work out. Instead I'm going to create a photobook with the support of Shutterfly. This photobook will be designed more like a small hard bound catalog specifically to order prints from us. I created this book in less than 20mins, but the catalog book will take a bit longer to create. Also, I did this book for my wife as it has 20 of her favorite images inside. Because I'm unable to edit past posts, I'll have to recreate this topic to update where and when the art/photography exhibit is to be held. On any given sunny day, a beam of light would enter our otherwise darkened basement. I thought to myself one day I'm going to use these elements in a photograph. At or about 12:30 pm est that beam of light was making it's way into our basement, Purely on a whim, I grabbed my 30 year old teddy bear bookend and placed it near the beam of light. Little did I know what was to happen. This unedited, natural light image was the only picture taken on that day as it was a one shot deal. I've posted this image at Gurushots, 500px and more with resounding positive feedback. Last month, I was asked to showcase this photograph at the Johns Hopkins Children's center art & Photography exhibit in late April. I've since had this print matted & framed by Aaron Brothers & Michaels. Knowing that my photograph can or could be sold during this exhibit, I've placed a price of $3,000 on this print with 90% of that going towards the Johns Hopkins Children's Center. So not only is one buying my print, But they're helping support a great cause. 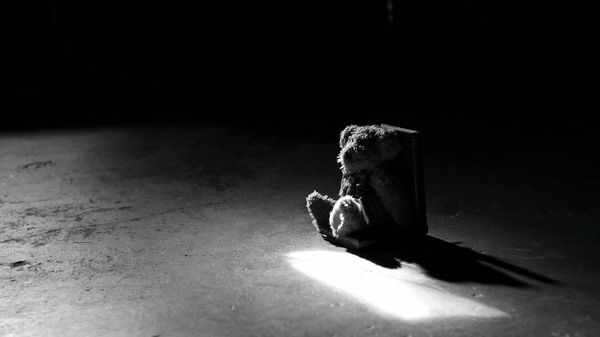 "The Lonely Teddy Bear Bookend is a very moving photo, in emotional content, rich variety of textures, and striking, This wrong composition was perfect for the emotional tone of the shot. I hope you continue to pursue your unique personal expressions." Currently I'm asking $3,000 for this matted/framed print with 90% of that going to help support the Johns Hopkins Children's Center. Not only will one get this limited print, but they will be supporting a great cause. The only way to buy this print and make sure that all funds are distributed equally, is to attend this art/photography exhibit late April early May.